Haverstraw is a village in the town of Haverstraw, north of Congers and east of Garnerville. 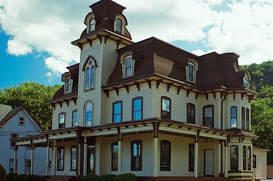 Known for its brick-making history (which can be revisited at the historic Bricktown Inn), Haverstraw is also a destination for hikers (who enjoy the beautiful scenery at South Mountain), walkers (at Emeline Park, which also has waterfront access), and sailors (at the Great HudsonSailing Center, which holds sailing courses). The Arts Alliance of Haverstraw, a non-profit multicultural center, holds special cultural events, such as photography and art exhibits and art and writing workshops, while the Haverstraw Youth Theater holds family-friendly productions. For dining, there’s Union Restaurant (owned by former Freelance Café Chef & Maître D’), Antoine McGuire’s, Soup Stone Café, Mariella’s Pizzeria, and Italian Food Center (best Italian combo you will ever eat, yes, we make the drive from Nyack all the time).